INTRODUCTION: The complexity in the procedures laparoscopy assisted gastrectomy (LAG) for gastric cancer disturbs the smooth spread. 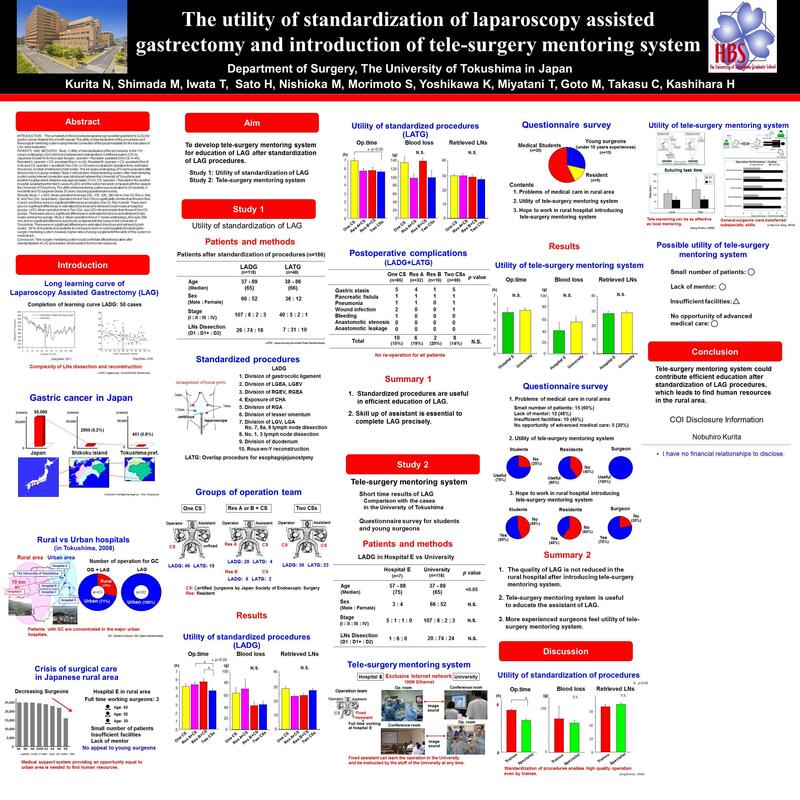 The utility of standardization of the procedures and telesurgical mentoring system using internet connection of the plural hospitals for the education of LAG were evaluated. PATIENTS AND METHODS Study 1 Utility of standardization of the procedures: In the 110 cases undergoing LADG which procedures were standardized, Certified surgeon (CS) by Japanese Society for Endoscopic Surgery: operator + Resident: assistant (Group A: n=33), Resident I: operator + CS: assistant (Group B: n=26), Resident II: operator + CS: assistant (Group C: n=5) and CS: operator + assistant (Group D: n=33) were compared in operation time, estimated blood loss, number of retrieved lymph nodes. The 41 cases undergoing LATG were evaluated after division into A-D group similarly. Study 2 Introduction of telementoring system: After Telementoring system using internet connection was introduced between the University of Tokushima and another hospital which distance was approximately 70 km, CS: operator + Resident in the another hospital: assistant performed 6 cases of LADG and the outcomes were compared with the cases in the University of Tokushima. The utility of telementoring system was evaluated by 20 students, 5 residents and 10 surgeons below 35 years old using questionnaire survey. Results Study 1: LADG: Mean operation time was 296?323?329?285 min in Group A, B, C and D, respectively. Operation time in Group D is significantly shorter than those in Group B and C and there were no significant differences among the Group A, B and C. There were also no significant differences in estimated blood loss and retrieved lymph nodes among four groups. LATG: Mean operation time in Group D was 352 min and shorter than those of other groups. There were also no significant differences in estimated blood loss and retrieved lymph nodes among four groups. Study 2: Mean operation time in 6 cases undergoing LADG was 310 min and no significant difference was found compared with that of group A in the University of Tokushima. There were no significant differences in estimated blood loss and retrieved lymph nodes. 50 % of residents and students answered that telementoring system was not useful, however, almost all surgeons felt the utility of this system in medical aid. Conclusion: Standardization of the procedures was essential for education of LAG and telesurgical mentoring system could contribute medical aid and education, which leads to findings of human resources.